Pope Francis has told the Food and Agricultural Organization that hunger is not just a natural phenomenon, but rather is the result of selfishness and wars. The Pope on July 3 said that the FAO - must always be in a position to intervene when people do not have enough to eat. 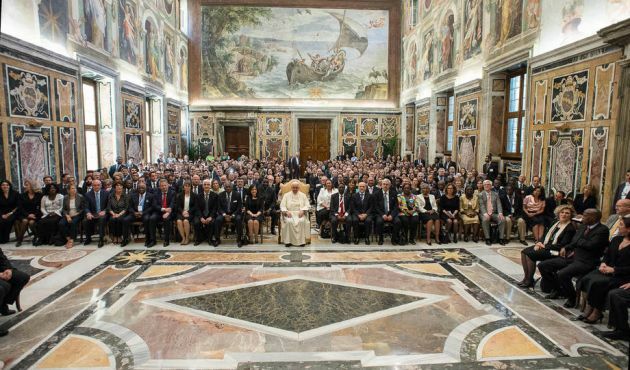 Francis was addressing staff and employees of the Rome-based United Nations food agency gathered for their 40th general conference. The Pope reminded the international community of its duty of solidarity. He said malnutrition is the "result of a more complex condition of underdevelopment caused by the indifference of many or the selfishness of a few." At the same time he noted, "All of us realize that the intention to provide everyone with his or her daily bread is not enough. Rather, there is a need to recognize that all have a right to it and they must therefore benefit from it." Francis' message was read out by Cardinal Pietro Parolin. In it the Pope wrote, "The Holy See closely follows the work of the international community and wishes to assist its efforts to promote not mere progress or development goals in theory, but rather the actual elimination of hunger and malnutrition. "All of us realize that the intention to provide everyone with his or her daily bread is not enough." "Rather," he said, "there is a need to recognize that all have a right to it and they must therefore benefit from it. "If the goals we continue to propose still remain distant, that is largely dependent on the lack of a culture of solidarity, which fails to make headway amid other international activities, which often remain bound only to the pragmatism of statistics or the desire for efficiency that lacks the idea of sharing." Pope Francis reminded humanity of the commitment asked of it by the 2030 Development Agenda, which restates the idea that food security as a goal that can no longer be put off.